Wedding PR: My Hotel Wedding, Wedding IQ, and more! Wedding PR: Travel Channel, My Hotel Wedding, and more! From The Travel Channel to My Hotel Wedding to Wedding IQ, we’ve got tons of great client to features on the blog for you to see today! Check it all out below. 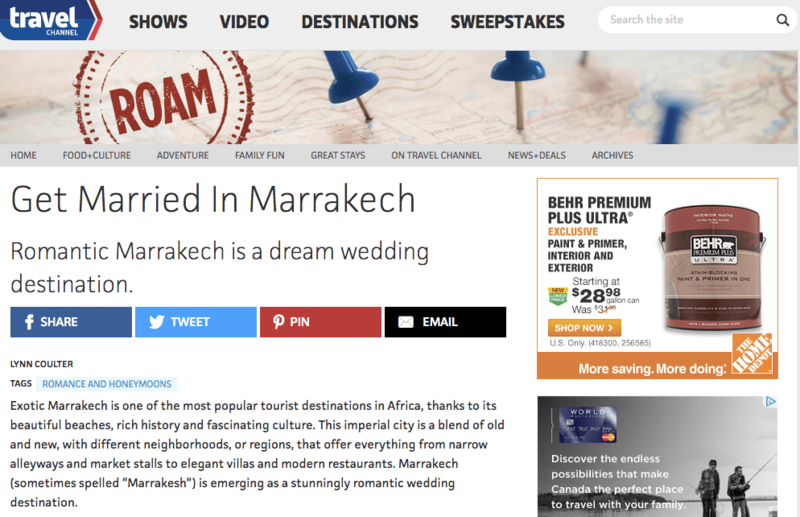 Cocoon Events Group was featured on Travel Channel as expert commentary in the article Get Married in Marrakech. See the full article here. Be Photography was featured on My Hotel Wedding with a Cape May wedding in New Jersey. See the full feature here. Destination Weddings was featured on Special Events with their guest article, LGBT Destinations on the Rise for Weddings. See the full article here. Taylor’d Events, Mike B Photography, Bergerons Flowers, Be Photography, and Historic Mankin Mansion were featured on Wedding IQ in an article about wedding pros day-of kits. See the full feature here. Fantasy Sound Event Services was featured on Plan The Day with their guest blog Top 5 Wedding Apps We’re In Love With. See the full feature here. Wente Vineyards was featured on The Knot in the article Outdoor Wedding? Yes, You Need a Backup Plan. See the full article here. Fantasy Sound Event Services was featured on Catersource with their guest blog Pay Your Dues: Maximizing benefits of association memberships. See the full feature here. Taylor’d Events was featured on Carats & Cake with a real wedding in Washington. See the full feature here. Destination Weddings and OFD Consulting were featured in the #WeDoLove video on GayWeddings.com. See the full video here. Fantasy Sound Event Services was featured on Special Events with their guest blog The Key to Staying Sane (and Productive!) During Peak Event Season. See the full article here.